Notes: Based on the manga by Shigeno Shuichi. As his high school graduation draws near, Fujiwara Takumi is approached by Takahashi Ryousuke, who intends to recruit Takumi for a racing team that he will be forming. However, this is not any ordinary racing team - it will be made up of the best racing drivers that Ryousuke can find, and their objective is to challenge racers around Japan on their home tracks, and of course - to win. However, Takumi still isn't sure that he's up to the task, and there remain a number of things that he feels should be attended to first, including his relationship with Mogi. What will be the future of Akina's downhill ace? Will he take up Ryousuke's offer, or will someone else beat him to it? Are we there yet? Are we there yet? Are we there yet? If you're reading this review voluntarily, chances are you're an Initial D fan, and a big one at that. It's also quite possible that you've heard of the various changes that TokyoPop has done to the Initial D dub, including ... questionable name changes and removal of controversial scenes. I'm not going to discuss that, as I haven't actually watched the edited myself, but it had to be mentioned since I'm still using the original names of the characters in the review. Alleged brutal crimes against Initial D fandom aside, I can separate the majority of readers of this review into a further two categories: the die-hard fans who, no matter what I say in here, will go out and watch/buy this anyway; and of course, those who have seen the first two stages, caught on to the hideously simple plot (what plot? ), and are wondering if it's actually worth continuing with what seems to be the same drifts just with different cars swapped in. If you're in the latter category, keep reading. So, is this new flick going to bring something refreshing into the mix? Can the jump to the big screen actually bring a new dimension to the level of creativity (what creativity?) we've seen from the series so far? Frankly, you'd be better off hoping someone would stick a turbocharger in a fish. 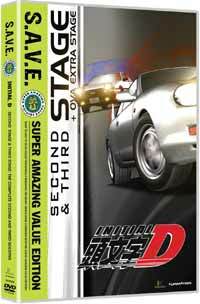 Don't let the flashy runtime fool you - what you'd be getting in the 3rd stage is nothing more than 3 episodes worth of generic Initial D action glued together and put on widescreen. Oh, don't get me wrong - I do enjoy watching some of the CG races, absurd as some of them are, but that's not the point. All I need to tell you is: expect nothing more, nothing less than the usual. Sure, people will point out that there's actual story in the movie. Yes, we do get to see a bit more of Takumi's troubled relationship with his girlfriend, Mogi, and probably a dash of character development on the side. However, as you start to take it all in, you'll begin to notice that the purpose of this whole thing is nothing more than to provide the transition from the 2nd Stage to the 4th Stage. What seems like a complete movie plot is, well, just an ordinary segment lifted from the still-running Initial D manga. Knowing the people who would be reading this review, it's also safe for me to assume that you know what it all looks like as well. Nothing in the art style has changed from the 2nd Stage, which means it's the same hybrid of CG cars and unappealing character designs that we're all familiar with. If there was a boost in quality due to a bigger movie budget, it wasn't obvious enough to notice. I've seen worse, though, so I'll refrain from complaining, lest they come and haunt me with Eurobeat music in my sleep. What else can I say, then? If Initial D's vicious cycle of drift-gasp-talk-challenge is starting to wear you down, you probably should find other anime to watch. For the fans, though, it will provide some progression on the Takumi-Mogi relationship and get everyone's adrenaline pumping for the 4th Stage. Recommended Audience: Nothing severely objectionable, except for general male recklessness.